The Golden Triangle tour is a private tour & can be started any time of year / month. The car, guides will be exclusively for you only. Golden Triangle tour is based on private departures, whereby you can benefit from having a private air-conditioned car, stop en-route for breaks or photo opportunities. 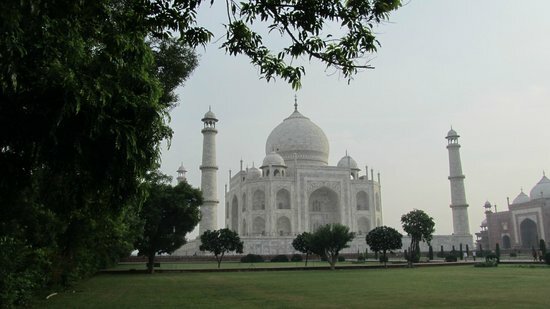 Delhi, Agra and Jaipur Tour - this golden triangle tour brings to you rich cultural history and majestic architecture of India. Visit breathtaking palaces and lively markets from the historical capital Delhi to Agra and the city of valour, Jaipur. Experience the wonder that is the Golden Triangle Special Tour! On Arrival met at Airport and drive to Agra visiting Sikandra enroute, arrive Agra check into the hotel, later visit the Agra Fort containing the Pearl Mosque, the Halls of Public and Private Audience. Overnight at Hotel. After breakfast drive to Jaipur, enroute visit Fatehpur Sikri, Fatehpur Sikri was built during 1571 and 1585. Fatehpur Sikri is one of the finest examples of Mughal architectural splendour at its height. Though the city is in ruins, it is a place to visit if one comes to Agra.But in real terms Fatehpur Sikri is a place where one should spend some time. The sunset over the ruins is sight to cherish. arrive Jaipur check into the hotel. Overnight at Hotel. Mirak Mirza Ghiyath, a Persian, was the architect employed by Haji Begam for this tomb. The tomb proper stands in the centre of a square garden, divided into four main parterres by causeways (charbagh), in the centre of which ran shallow water-channels. The high rubble built enclosure is entered through two lofty double-storeyed gateways on the west and south. A baradari (pavilion) occupies the centre of the eastern wall and a hammam (bath chamber) in the centre of northern wall. The square red sandstone double-storeyed structure of the mausoleum with chamfered corners rises from a 7-m. high square terrace, raised over a series of cells, which are accessible through, arches on each side. The grave proper in the centre of this cell-complex is reached by a passage on the south. The octagonal central chamber contains the cenotaph, and the diagonal sides lead to corner-chambers which house the graves of other members of the royal family. Externally each side of the tomb, its elevations. Delhi Agra Jaipur Tour Travel (Product of A-1 Tours and Travels) was founded in 1990 with a vision to achieve the excellence in service, quality and commitment in the field of travel and tourism. The management of A-1 Tours and Travels had decided to develop a company as a travel service provider with a difference and to achieve this with a visionary outlook and a combination of technology, sense of enterprise and a passion for what one pursue-in the travel industry. The company has steadily grown since its inception and today have a dedicated team of travel professionals, resources and hands on experience to guide you through the array of top quality travel arrangements. We are approved by Deptt. of Tourism, Govt. of Rajasthan, INDIA we have our own fleet of latest models of all makes of cars and luxury coaches. All our drivers are experienced and well versed with the national highways and inner regions of each city and villages. We have devised various tour packages to the varied preferences of our clients and that too with some new and lesser-know . Albert Hall, located a few hundred meters away from Pink city, facing the City, welcomes every visitor of the city. Albert Hall is a museum, which is supposed to be the oldest in the Rajasthan state. It was designed by Colonel Swinton Jacob in 1876 to welcome King Edward VII as Prince of Wales on his visit to Jaipur. The Albert Hall Museum in Jaipur is one of the finest museums of the 19th Century. It was envisioned by Maharaja Sawai Ram Singh-II & bought to life by Thomas Holbein Handley. The Albert Hall building was designed by Sir Samual Swinton Jacob. It is now a house of antiquities. In 1885, it was opened for public. Albert Hall galleries the antique articles on its display including textiles, paintings, craftworks, pottery, arms and weapons, culture of the state and an Egyptian mummy that belongs to the Ptolemaic Epoch. It also shows famous carpet, which depicts the Persian garden carpet with running water streams. The lower part of the musuem was redesigned in 1960 to completely display the culture and the heritage of the state which includes the lifestyle of the different tribes.The central part of the museum displays the Rajasthani culture and music. The greenary of the Albert Hall is the most eye-catching part of the visit. Albert Hall houses the Central Museum, which has numerous pieces of art. So it is fitting that the building itself be a piece of fine art, an architectural marvel.